Hermitage Green is a prime example of a fresh new generation of Irish music emerging from the scene. It’s an industry that’s booming with talent at the minute, if you haven’t noticed, and Hermitage Green are just one of many Irish names that we’re going to see creating a stir in 2015. I sat down with Darragh Graham, who plays the banjo, djembe and sings backing vocals for the band. I briefly couldn’t find Darragh, and asked every living person in UCC had they seen a loose member of Hermitage Green wandering around the place. Everyone found this very amusing. Mr Graham himself (who was eventually located) has many accolades in the Irish athletics and sporting field, as well as in the music scene. A former 100m and 200m sprinter for the Republic of Ireland, Graham also coached the Leinster Senior Rugby team, the Tipperary Senior Hurling team and the Irish Paralympic Team. Not to mention holding a PhD in the area of strength and condition. However, today we were together to talk about music. In particular, we were together to discuss the very interesting sounds of acoustic folk rock band, Hermitage Green. 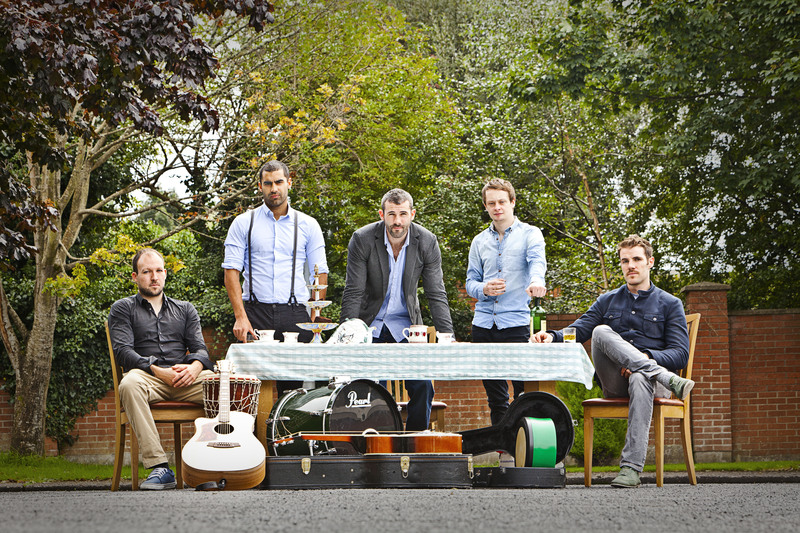 Hermitage Green, like most bands, incorporates many different instruments and genres. However, unlike most bands, Hermitage Green’s members play around with a Dobro, a harmonica, a didgeridoo, a banjo, a djembe, some guitars, a bodhrán, four part harmonies, and a piano. For obvious reasons, it wasn’t an unusual question for Graham to be asked how he would go about describing his music to someone who couldn’t hear it. The five person Hermitage Green first began creating music together back in July 2010, in what Graham described as an accident. Their curious arrangement of instruments might stem from the fact their band was born from a spontaneous jam session between friends; friends of different musical backgrounds and tastes. Since then the originally Limerick-based group have steadily been gathering momentum, which it was evident from speaking with Graham, is a momentum that is doing nothing but driving onwards. The story of the band’s unusual name was as interesting as their music, and it’s an origin I certainly wasn’t expecting to hear. A name with a meaning for a band with meaning – Graham went on to speak with admirable passion about the band’s creative process and it seems tides are turning in their creative process right now. Known predominantly for fantastic interpretations of other artists’ songs (‘Teardrop,’ ‘Walking in the Air’ and ‘Cosmic Love,’ to name a few) but with original tracks like the fan favourite ‘Gibson’ also to their name, it’s the future originals that will be the ones that get Hermitage Green the next boost they are looking for. Graham, at least, seems to have the focus needed to produce the motivation behind a next phase of music for the group. Presumably, this is going to have a colossal effect on the type of music the band produces. It’s early days in 2015 yet and if the move has been for better or worse remains to be seen. However, Graham feels it has been a beneficial move, one which allows them to put more of themselves into their live performances. Hermitage Green’s story makes breaking into the music scene and making all these catchy songs sound relatively simply but in a competitive industry, even one as diverse as Ireland’s, it isn’t really all that simple. It all comes down to one very basic thing; the quality of the music. The band will have their work cut out to them to reach the heights Hozier and others are at right now, but Hermitage Green certainly have the basic aspect covered in that they have piles upon piles of raw talent. Every time I’ve listened to the band they’ve sounded like a band on the very brink of getting everything completely right. Maybe there was something missing but Graham claims they’ve found something new this year, it could be the missing part of the puzzle. Motley Magazine January 24, 2015 June 2, 2015 entertainment, Hermitage Green, Motley Magazine, Music, R&G Week.